The HTS Heart pins are just that, a small red heart that you can pin on your dress, shirt, collar, etc. The pins are to wear when you go out to party. WHEREVER you go. They can be worn at the lifestyle clubs AND the non lifestyle clubs. We don't always hang out exclusively in lifestyle clubs. It is a discreet way for fellow HTS members to know who you are and for you to know who they are. Yes, You may also be able to receive discounts on cover charges in several of the lifestyle clubs around town if you are wearing your HTS pins. Currently in the Houston area you can receive a discount off the cover charges, on either Friday or Saturday nights, at The Mystery Zone (any night they are open), and Wishs Club. You can also receive 20% off your purchases at Smoochee's (3333 Katy Fwy) if you are wearing your pins. A 20% Discount at Bizarre Times (Richmond and Dunvale), a 10% discount at Sinsations Boutique in Austin and 10% at Shades of Love in San Antonio. Important: You must be wearing your Heart Pin and ASK for your discount! More clubs and retail outlets coming soon in both Houston and other cities in the U.S. 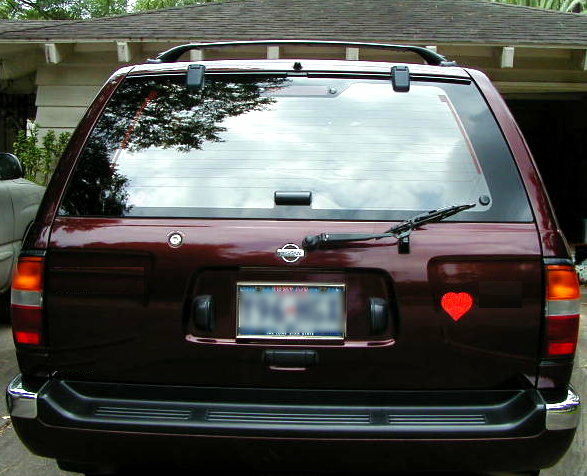 These are Red Heart magnets for your car. Place one on the back when you are going places. Other members who may be looking for you can spot your car or truck with out you placing a sign up saying "Swingers Here". Several members use them for others to meet them while out at the beach. We have pins for only $2.00 each when we are out. If you see us at a club just ask. If you would like to order one by mail, please send $3.00 for each pin ordered to cover postage and packaging to the address below. Same goes for Heart Magnets price is $5.00 each if you see us out and about and $6.00 by mail. When ordering by mail please be sure to tell us what you are ordering either pins or magnets or both. Be sure to include your User Name here and the address you want the pin(s) sent to (we send them in a plain brown packages).